Pleasure, emotion, voice! These are the ingredients of “The High Art of Singing”, a captivating program of choral music to be performed by the 21-voice Island Consort chamber choir. This ensemble, with its roots in Early Music, will begin the program with a nod to the Christmas season, with Tomas Luis Victoria’s “O Magnum Mysterium”, followed by two movements from Buxtehude’s “Membra Jesu Nostri”. 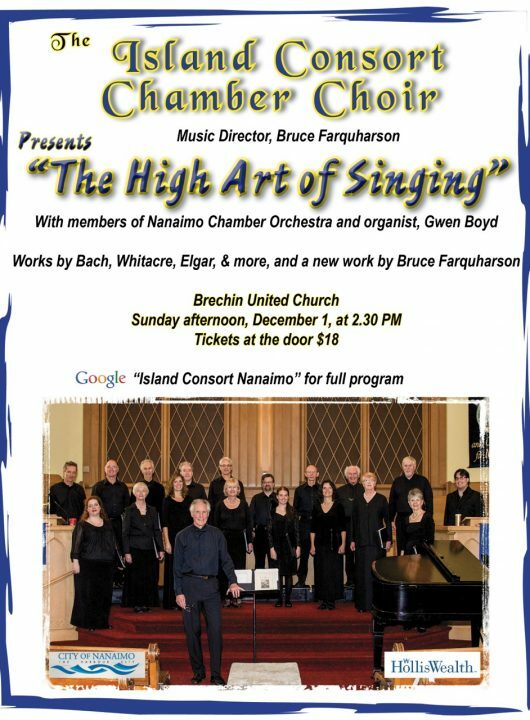 This large work includes soloists from the choir and accompaniment by organ and a small ensemble of string players from the Nanaimo Chamber Orchestra. Completing the Early Music material is Thomas Tompkins “When David Heard” and J.S. Bach’s motet for double choir, “Ich Lasse Dich Nicht”. Following works by Mendelssohn, Bortniansky and Elgar, the choir will sing Britten’s “Choral Dances for Gloriana” as a tribute to the 100th anniversary of his birth. Last spring the Island Consort competed for the first time in the biannual National Choral Competition and has made good use of the adjudicators’ comments. To celebrate this event Director, Bruce Farquharson, has composed a very West Coast piece, “This Kyrie”, which will be premiered along with his transcription of Myer’s “Cavatina” from the soundtrack of “The Deer Hunter”. These contemporary pieces will segue to Whitacre’s “Go, Lovely Rose”, and the program will end with two songs for Christmas; “Tomorrow Shall be My Dancing Day” and a beautiful harp-accompanied rendition of “Silent Night” (titled “Still, Still Night by American, Jackson Berkey).